Glycated haemoglobin or HbA1c is formed by the reaction of glucose with normal haemoglobin. The amount of HbA1c in red blood cells therefore increases with the average blood glucose concentration. Poor control of blood glucose levels in diabetes increases the risk of serious complications such as cardiovascular disease, neuropathy and retinopathy. Measurement of HbA1c is the method of choice for monitoring control of blood glucose levels in diabetic patients. The Axis-Shield HbA1c turbidimetric immunoassay provides a highly accurate and precise method for measurement of HbA1c in whole blood on any clinical chemistry analyser with a number of convenient features. Two liquid-stable reagents. A 5-level calibrator pack and 2-level control pack are also available. 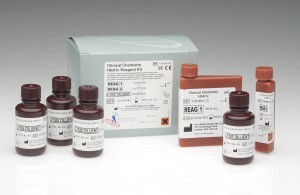 The HbA1c assay is an Immunoturbidimetric immunoassay for the quantitative determination of percent haemoglobin A1c (HbA1c) in human whole blood on clinical chemistry analysers. Percent HbA1c measurements are used for monitoring long-term glycaemic control in diabetic patients. The Axis-Shield HbA1c assay utilises the interaction of antigen and antibody to directly determine the concentration of HbA1c (%) in whole blood. Whole blood samples are treated with Lysis Diluent to lyse the red blood cells. Lysed sample is then incubated with latex microparticles (Reag 1). Haemoglobin and HbA1c are captured on the microparticles. When anti-HbA1c (mouse monoclonal) antibody (Reag 2) is added, latex-HbA1c-antibody complex is formed. The amount of agglutination is measured turbidimetrically and is proportional to the amount of HbA1c absorbed on the surface of the microparticles.